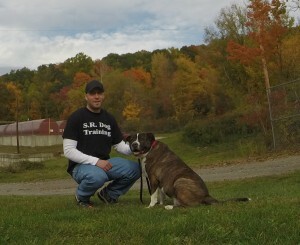 Owners are always looking for fun and simple ways to play with and exercise their dogs. However, laser pointers are not one of those options. There is a great danger of using a laser pointer with your dog. Dogs do like to chase, as it taps into their prey drive and naturalistic instincts. The essential component is that the items they are chasing must be tangible – something the can see, feel, touch and actually catch. The last one is key…something they can actually catch. Laser pointers will cause neurotic and compulsive behavior in dogs, as they cannot actually touch, feel, and catch the visible light they are chasing. You do NOT want your dog to develop the neurotic and obsessive behaviors that are associated with using laser pointers, as it is virtually impossible to stop. Dogs that have used laser pointers typically begin chasing all shadows they see. Shadows from people, objects, trees and leaves blowing in the wind, etc. This is psychologically very tormenting for your dog. 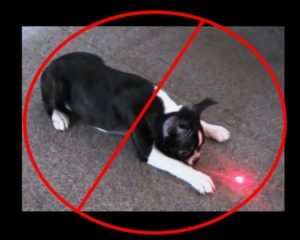 Therefore, NEVER use a laser pointer with your dog. If you want to play with your dog and allow them to relieve their energy, prey drive, and natural instincts to chase; I suggest Fetch, Tug, or a flirt pole. It’s critical that your dog be able to actually succeed in catching the item they are chasing. Most owners are unaware of the dangers associated with using a laser pointer with their dog. So please be sure to mention this important concept with your dog owning friends, family members, people at the dog park and even at work. The more people that know this, the more dogs that will stay happy and healthy. Neurotic and obsessive behaviors associated with laser pointers are needless problems for dogs and owners to struggle with. It is completely preventable, simply avoid using a laser pointer with your dog. Instead, go for a walk with your dog, take them in the car for a ride, practice obedience commands or play using tangible items in games like Fetch or Tug.